Ignacio Agramonte y Loynáz (1841—1873) was a Cuban revolutionary, who played an important part in the Ten Years' War (1868-1878). The Ten Years' War (1868-1878) was the first of three wars that Cuba fought against Spain for its freedom, the other two being The Small War (La Guerra Chiquita; 1879-1880) and the Cuban War of Independence (1895-1898). The final three months of the last conflict escalated to become the Spanish-American War. Young, wealthy, and talented, Ignacio Agramonte was a leader of the Cuban revolt against Spanish colonial rule. He also was instrumental in drafting the Cuban Constitution of 1869 of what was called the Republic-in-Arms. Agramonte died fighting for his nation's freedom. He did not foresee that democracy in Cuba would remain vulnerable to dictatorial rule followed by a communist state. Rather, he championed freedom, and for that his memory continues to be honored as a hero of the nation's liberation struggle. Agramonte was born in the province of Puerto Príncipe, which became the province of Camagüey, Cuba, to a wealthy family. He was described as being tall, was 6' 2" (1.9m) tall, with brown, fine hair, and pale skin, but muscular; fortified by horsemanship and fencing. He traveled to Barcelona and Madrid, Spain, and finally to Havana studying law. On June 11, 1865, he graduated from Havana University with a doctor of legal law degree. Agramonte returned home to Camagüey and married his life long love, Amalia Simoni, in August of 1868. The union was of two powerful families. As wealthy as the Agramontes were, the Simoni's family had considerably more wealth. When the insurrection against the Spanish colonials broke out on October 10, 1868 under the leadership of attorney Carlos Manuel de Céspedes and seconded by a group of patriots in the sugar mill La Demajagua, they called for the liberty and independence of the island from Spain. Agramonte played a pivotal role in the uprising of the province of Camagüey which began several weeks later on November 4. Agramonte himself joined the insurrection a week later, on November 11. Amalia Agramonte followed him in the struggle, but was captured on May 26, 1870 while pregnant with their second child. His wife escaped to the United States and his son was born there and never met his father. In 1868, meeting with other leaders who were trying to make amends with Spain, Agramonte made his thinking clear. "Stop at once all the lobbying, the awkward delays, and the humiliating demands. Cuba's only option is to gain its redemption by tearing it from Spain by armed force," he said. In February, 1869, Agramonte and Antonio Zambrana were elected secretaries (a title equivalent to minister) to the provincial government. On April 10, 1869, a constitutional assembly took place in the town of Guáimaro in the province of Camagüey. Agramonte was subsequently elected a member and one of two secretaries – ministers – of the Cuban Congress. He was among the signatories of the act that freed the slaves on the island and was the driving force in the drafting of the first Constitution in Cuban history. He resigned his position within the Congress after Carlos Manuel de Céspedes was made president later the same year. Agramonte had strong political disagreements with de Céspedes and believed they could not work together. Agramonte had come to realize that his dream of constitution and government were ill suited to the Cuban Republic in Arms, which was the reason he quit as secretary and assumed command of the Camaguey region. Agramonte became a Major General of the Cuban Army for the military district of the province, where he organized some of the most disciplined cavalry troops in the Cuban Army. Showing great vision, in spite of his lack of formal military training, his troops routinely terrified the Spanish Army. Agramonte capped his impressive list of military achievements on October 8, 1871. His commander, Manuel Sanguily, had been taken prisoner by more than 120 light cavalry while visiting a farm. Agramonte ordered 35 of his exhausted troops to track down the Spaniards. He personally led a furious charge, successfully rescuing Sanguily and routing the enemy troops, killing 11 and taking 5 prisoners. Agramonte was killed at the Battle of Jimaguayú on May 11, 1873, when he was struck in the head by a stray bullet. His body was captured and cremated by the Spanish authorities in Camagüey, for fear that his troops would assault the city again and attempt to recover his body. Henry Reeve, a Brigadier General in the Cuban Army, and an American volunteer was the commander of another Cavalry Corps serving alongside Agramonte. Reeve named Agramonte "El Mayor," implying that Agramonte was the best of all the Cuban generals. Agramonte had responded by nicknaming Reeve "Enrique - El Americano" and oftern calling him "El Inglesito." After Agramonte was killed, Máximo Gómez y Báez succeeded him as Chief Military Commander of the military district of the province of Camagüey. Agramonte used a Colt revolver, a Navy model 1851, worked with ivory and gold. He used several machetes and sabers, and was carrying a saber taken from a Spanish colonel when he was killed. 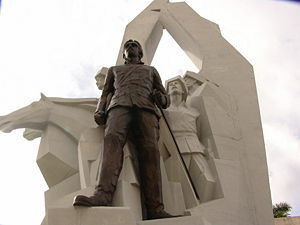 The airport and the central park in Camagüey are named after him, and his statue is situated in Camagüey's central plaza. On the centenary of his death, Silvio Rodriguez sang in Camaguey and premiered his song El Mayor, in honor of the fallen hero. The local radio station Radio Cadena Agramonte uses it as its identifying melody. El hombre se hizo siempre de todo material: de villas señoriales o barrio marginal. Toda época fue pieza de un rompecabezas para subir la cuesta del gran reino animal, con una mano negra y otra blanca mortal. Mortales ingredientes armaron al Mayor: luz de terratenientes y de Revolución: destreza de la esgrima, sucesos como un preso, Amalia abandonada por la bala, la vergüenza, el amor; o un fusilamiento, un viejo cuento modelaron su adiós. Va cabalgando El Mayor con su herida, y mientras más mortal el tajo, es más de vida. Va cabalgando sobre un palma escrita, y a la distancia de cien años resucita. Trota sobre la espuma, seguido por un mar de negros en machete y sin encadenar. Ordena a su corneta el toque de a degüello, y a un siglo de distancia entona nuestra canción y con recia garganta canta, espanta lejos la maldición. Va cabalgando El Mayor con su herida, y mientras más mortal el tajo es más de vida. va cabalgando sobre una palma escrita, y a la distancia de cien años resucita. This page was last modified on 24 February 2018, at 22:43.